More than just an 80’s band, “The Reflex”, created by brothers Rob Rantamaa and Jason Underwood in 2000, quickly became one of the most popular and well know acts in the city, and over the last 8 years has performed in many of the top venues on (and off) the Las Vegas strip. Each of the group’s members are accomplished musicians and singers, and have worked with many high profile acts in Las Vegas, and international acts and recording artists around the world. 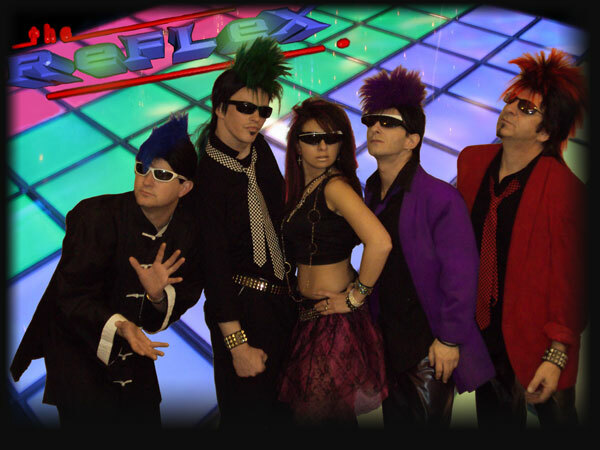 In 2000, “The Reflex” was the first band to perform at the House Of Blues flashback Fridays 80’s night, and soon after became the house band at Santa Fe Station for most of 2001, where they developed a huge local following. Next, they went on to be the first band to perform at The Palms on opening night , new year’s eve, and remained there for much of 2002. The band continued to perform at private events, and in larger venues such as The Monte Carlo Brew Pub, the Rio, Fremont Street Experience, just to name a few, and in 2003 ‘The Reflex’ became a favorite at Harrah’s Carnival Court, where they spent the next 4 years performing between 2-3 weeks every month. Over the years, ‘The Reflex’ has evolved to become more than just an 80’s band, performing disco hits from the 70’s, and great hits from the 90’s all the way up to current hits of today. The show is highly adaptable and each show can be built specifically for each venue. Also available are the various visual options for the show, such as go-go dancers and ‘the wheel’. Whatever you need, be it the 80’s or 80’s and more, showroom, lounge, nightclub, or private event, “The Reflex” will deliver! You can book The Reflex for your next event just by clicking the "Book Them Now" button to the right and filling out the form. We will be in contact with you about their availability as soon as possible.